Saint Ursula's Day is a public holiday in the British Virgin Islands, because Saint Ursula is patron saint of the Virgin Islands archipelago. It is celebrated on October 21. The British Virgin Islands (BVI) is a British overseas territory located in the Caribbean. It is part of the Virgin Islands archipelago. The archipelago was discovered by Christopher Columbus in 1493. The explrorer named the islands Santa Ursula y las Once Mil Vírgenes (Saint Ursula and her 11,000 Virgins) in honor of Saint Ursula. The name was commonly shortened to Las Vírgenes (The Virgins). 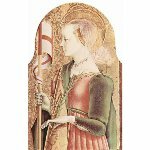 Saint Ursula is a Christian saint. She was a British princess who was supposed to marry the Brettonic leader Conan Meriadoc. Ursula set sail to join her future husband in Cologne, along with 11,000 virginal handmaidens. On her way to Cologne, she encountered Huns, who beheaded all the virgins in a massacre and then shot Ursula dead. Saint Ursula's feast day falls on October 21. It was officially designated as a public holiday in the BVI in 1957. Despite the fact that Saint Ursula is patron saint of the entire archipelago, it is not celebrated in the American Virgin Islands. On the occasion of the holiday, a traditional yacht race is typically organized.